Far too often, tax practitioners get too close to a filing deadline before disengaging from a client who has put them at risk by failing to provide the necessary information for a return to be prepared on time. The client may even fail to provide the information to complete a year’s worth of bookkeeping, which is supposed be used to prepare the returns. If a client has previously exhibited behavior that indicates they will not have their information to the CPA in a timely manner, or not pay on an outstanding account balance, we recommend that the CPA either enforce the stop-work clause in their engagement letter, or write a “drop dead” letter—a pre-disengagement letter indicating the problem that the client needs to resolve, such as providing payment or information, or contacting the firm for a further consultation. The letter should include a “drop-dead” date by which the client must comply to avoid disengagement. If the client does not comply, though, disengaging must be done well before the due date and preferably the day after the “drop-dead” date is missed. This will allow the client sufficient time to obtain the services of another tax preparer and thereby reduce the risk of a claim against the CPA. A well-timed letter is good defensive documentation in the event of an actual claim. When a client does not provide the information needed, carefully consider the problem. Is the problem sloppy record keeping, or is the client deliberately withholding information? If it looks deliberate, and the CPA is urged by the client to proceed with work without having proper documentation, this could be a red flag. Repeated delays might be the result of unethical or illegal activity. CPAs are often so busy during the tax season that they don’t recognize or acknowledge a potential claim as it is developing. 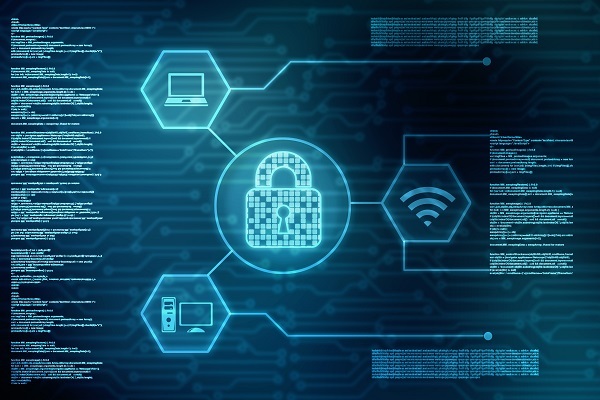 This has been an ongoing issue for CPAs and is particularly devastating when the damages claimed are significant and are not covered because of late reporting. It’s important for CPAs to pay more attention to potential issues and to report to their carriers as soon as they think there may be a problem with their services. CAMICO provides substantial incentives for early reporting, including deductible reductions, and tax penalty abatement and subpoena services. The company also offers “continuity of coverage,” which permits much later reporting by a CPA who has consistently renewed with us, even if that CPA knew of a potential claim but did not report it until the client makes an actual claim months or even years later. Difficult behavior on the part of a client should be investigated. It may be an indication of a failing business, financial problems, substance abuse or other personal problems. Uncovering the source of the problem might provide the client with some help, but take swift action to remedy the situation or disengage before the situation worsens. When your firm changes, you may also need to alter your client base. The loss of a partner with expertise that the other partners don't possess or have no desire to obtain will require a decision by the firm regarding continued service to this share of the client base. You may decide that you no longer want to continue performing a particular type of work. Or, you may decide to branch out and grow your business in new services. Review your client base whenever your firm changes in order to determine whether or not all existing clients are still a good fit for the firm. Review your resources and qualifications before expanding your services, and commit to a new service before you begin seeking clients. Consider all client situations carefully to spot potential conflicts of interest, which may affect your objectivity or independence—even if you are not engaged to do attestation work. Examine potential or actual conflicts of interest from a broad point of view, considering the client's perspective as well as those of other stakeholders such as owners, investors, partners, beneficiaries and spouses. Troublesome scenarios can include a partnership break-up, a failed investment, bankruptcy, a trust, mergers, divorces, or anything else that can create opposing or disappointed factions. When you decide to disengage, seek to terminate the relationship professionally and formally, in writing. Your disengagement letter should always contain clear statements, a description of the outstanding work and completed work, and a list of any due dates or filings. Again, provide ample lead time before a client’s deadlines to better protect yourself. Your client need not feel antagonized in any way. Many disengagements occur after a conversation with the client in order to prepare them for the forthcoming letter. 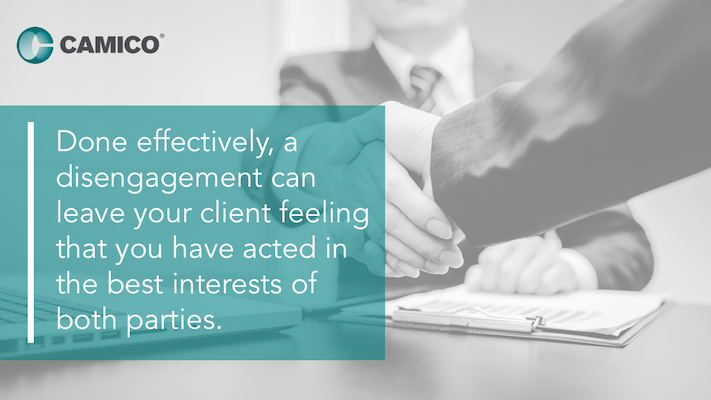 Done effectively, a disengagement can leave your client feeling that you have acted in the best interests of both parties. Effective communication is a key factor in any CPA-client relationship. When you work to stay informed and in control, you are safeguarding your firm. In the end, disengaging is simply good practice management, and knowing how to do it skillfully and professionally will help you grow your practice with the kinds of clients that will be satisfying and remain with your firm for a long time.